With the Christmas Season fast approaching, my thoughts turn to family and friends. Which leads me to think about all of the displaced families due the flood. Some of who are now calling a FEMA trailer home. If you haven’t been in one yet, you’re not missing much. They are very small, especially if you have kids. So how can you turn a small government living space into a festive, warm Christmas home. Here are some small ideas with big holiday cheer. How about trying a spruce top, which is creatively decorated in small a container with floral foam (for low maintenance watering) and can serve as a table top tree. 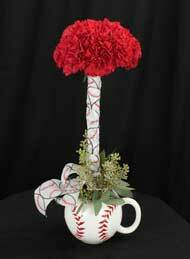 A large poinsettia would also serve as a very nice table top replacement tree. You would be able to place some Christmas ornments both on the spruce top and the large poinsettia. We do offer small 3′-4′ and 4′-5′ fresh cut Christmas trees, which might be small enough for a FEMA trailer. We also can flock the fresh cut tree. Flocking is a powder(usaully white) that is sprayed on the tree, which gives the appearance of being covered in snow. It also seals the tree, so there is no need for watering. The most important thing to remember is Christmas is in the heart and soul. It doesn’t matter where you are at, where your staying, or how big or small your home is, as long as you keep Christmas in your heart, your Holiday Season will be a great memory. Such a wonderful write up! I am definetly in the Christmas mood now! Merry Christmas to everyone at Lowe’s and all those who were unfortunate to have their home in the flood. Keep your head up and know it will get better. Keep on smiling! And don’t give up…..don’t ever give up! This is one of the best articles ever to be featured on this blog! And I can’t agree with you enough that “The most important thing to remember is Christmas is in the heart and soul. It doesn’t matter where you are at, where your staying, or how big or small your home is, as long as you keep Christmas in your heart, your Holiday Season will be a great memory.” Thank you for such a great blog post! Previous post: Common Questions: Advice for new gardeners about planters. Next post: Common Questions: What’s the best way to keep my Christmas Tree fresh?